On this page you will find products / equipment that I rate very highly and would use no other version of. There's safety equipment, both horse and rider clothing, horse feed, supplements......the list goes on! There will be NEW products added to this list regularly so don't forget to keep an eye on this page. Please Click Here for more detailed information on some of the many products my team, my horses and I couldn't live without! 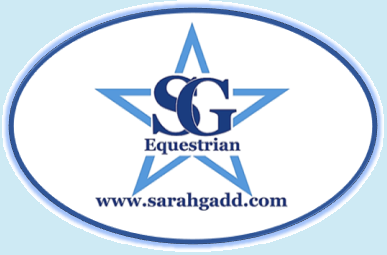 Products include Horse Supplements, Horse and Rider Clothing and much much more! If you have any questions about any products, including those not listed then please Contact Me. I have been rather unlucky and have had two bad falls in water complexes at events in the last few years but lucky enough to be ok after....well sort of!! The first of these was in 2008, when the horse i was riding put her foot in a whole on landing in the water sending me straight over the front and her down onto her knees. From this fall my horse was fine but I had severe cuts and abrasions to my ribs, arms, back, legs and shoulders. The second fall I had was much worse, my horse didn’t notice we were jumping into water as we were in woods and the course had been held leaving the water time to settle, so it looked like you were landing on normal mud ground. She had to have her stifle and her stomach stitched up and had to have a drain placed in her chest. But after this fall because I had my Point Two Air Jacket on, all that happened to me was I got a bit wet! 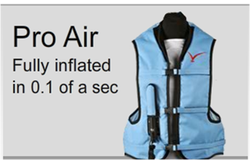 So I rate my Point Two Air Jacket very highly now and wouldn’t go cross country without it. I also wear mine when I am breaking young horses because at the end of the day I know they are expensive but how much do you value your life at?!?!? I don’t know what I would have done without this supplement or powder!! Still Learning had numerous Sarcoids on her when I brought her which soon escalated with one growing as big as a grapefruit on her stomach, just under her stud guard. As well as feeding Sarc-Ex I also tied them off with plaiting thread soaked in Hibi-Scrub and then put Sarc-Cream on them all daily. After the biggest Sarcoid had fallen off and now three years on with the help of Sarc-Ex she now has not any Sarcoids left on her body and her hair is growing back where they once were. This product, like Sarc-Ex, has worked fantastically on Still Learning! She suffers severley with her hormone imbalances and my team, my vet and I were tearing our hair out as to what would be best to feed!?! The only product left to try would have been Regumate solution which, yes, it is fantastic but it comes with a rather large price tag on!!! She is fed the 'Plus' version during the Spring and Summer months and than is put onto the normal FriskyMare for the Autumn / Winter months. This product is traditionally used to help maintain balance & comfort in the reproductive system of mares during the breeding season or at any tiime of year. This specially formulated product contains all the essential vitamins and minerals, including zinc, that your horse requires. They are highly absorbable and about as close as you can get to the nutrients that your horse gets from its food. 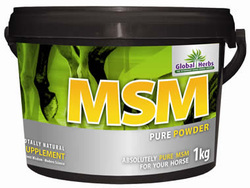 This product gives fantastic coat shine and when fed alongside Global Herbs MSM Powder, (see below) it naturally helps maintain your horse's joints and tendons in good working order, keeping them comfortable and strong. MSM is a constituent of vitamins, co-enzymes and antioxidants which are essential for good health and peak fitness. 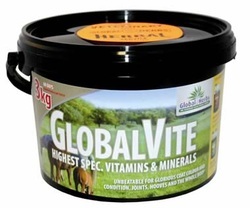 This powder, fed alongside GlobalVite (see above) has worked absolutely fantastically on all my horses! My team and I think it is as good if not BETTER than any other joint supplement on the market. MacWet Gloves are 'THE' best gloves ever made. The saying 'all grip, no slip' is completely true and these technologically advanced gloves have become a global sensation! Their promise of unrivalled grip in all weather conditions means that they perform just as superbly when wet as when dry. They offer two high quality ranges in fourteen different sizes, and come in Black, White, Black/White, Brown Navy and Green colours.